Learn to Fish with KIN! It’s FREE! Time: 8:30 a.m. – 12:00 p.m. 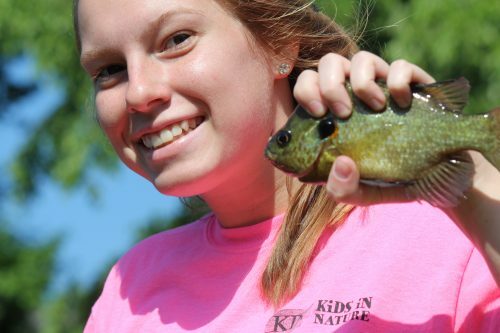 Kids In Nature (KIN) is hosting a FREE Fishing Derby/Learn to Fish Day in Durham. It’s a guaranteed good time – the pond is stocked with largemouth bass, channel catfish, bluegill, and black crappie. We get it, fishing can be BORING for kids; especially if they’re not catching fish. Fishing with KIN is fun. Kids are practically guaranteed to reel ‘em in all morning long. KIN staff and volunteers will provide fun, games, and basic instruction on casting, baiting hooks, and catch and release techniques. We have a limited supply of fishing poles and tackle that we will lend out; if you have your own gear – please bring it. All children must have a parent or guardian present. Space is limited to 25 kids, and pre-registration is required. Please click on “Sign Up” below to register. Registration is FREE. Once you click the “Sign Up” button- select “Fishing – September 15” under the “Name of Event” section. Registration is first-come-first-served, so don’t wait. *After you register, you will receive an email with further instructions and the location of the event. Kids In Nature (KIN) is a non-profit subsidiary of the NC Waterfowl Restoration Project, an exempt organization as described in section 501(c)3 of the Internal Revenue Code. Federal EIN # 46-1729695.